I have to come clean about something. Last November while attending the Chicago Toy & Game Fair at Navy Pier I glossed over a game from Spin Master that was brand new and making its debut. I judged it immediately as too juvenile for my girls, even though it had a 7+ age rating. And even though the display table had a line of kids roughly the same age as my girls waiting to play, I was more enamored with the synchronized DigiBirds at the same booth. In a nutshell, I was wrong to dismiss it so quickly. Fortunately Spin Master knows their product better than I, so they insisted we try out a copy. I was still hesitant, so I elected to bring it to our weekly game night when I knew there would be plenty of kids to give it a try (translation: I didn’t want to play). Amazingly, it was a hit. Strike two for me. So I guess I should tell you a little something about this game so you can make up your own mind! 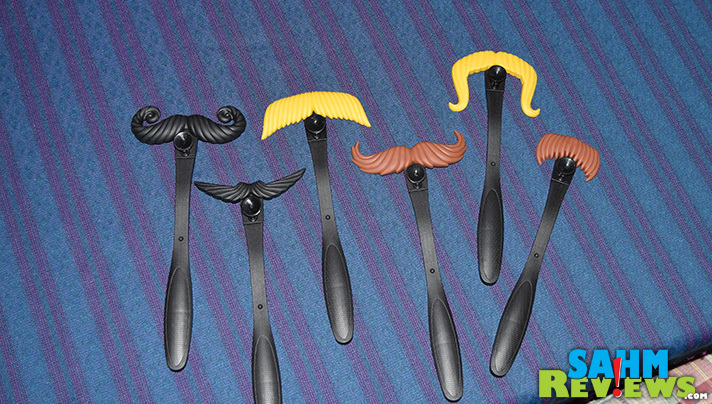 In the box you receive six moustaches on handles, each with a different shape and color. Also included is a deck of 32 cards that contains pictures of said moustaches. The object – when a card is overturned you must quickly determine if it is a match for your ‘stache by either shape or color. If it is, you attempt to capture it by smashing it with your handle. On each handle there is a small suction cup that grabs the card. First to get their handle down wins the card (and any underneath it). The game continues until all cards have been played and claimed. There are a couple extra non-moustache cards in the deck. 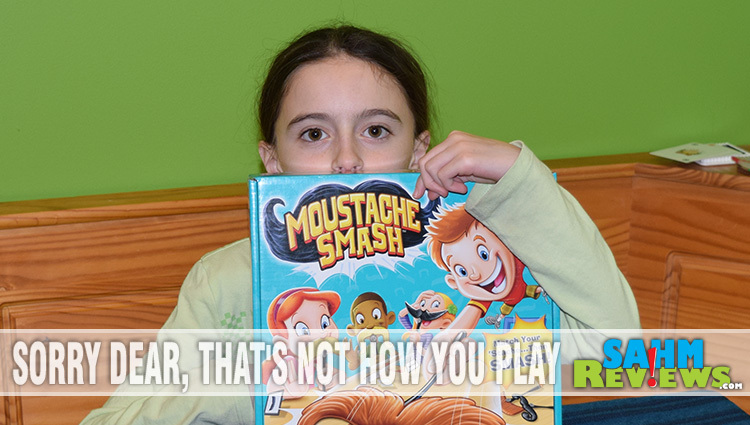 The first is called “Moustache Smash” and can be considered a wild card that anyone can claim. There is also a “Moustache Pass” card that when exposed, required you to pass your moustache to the person on your left. 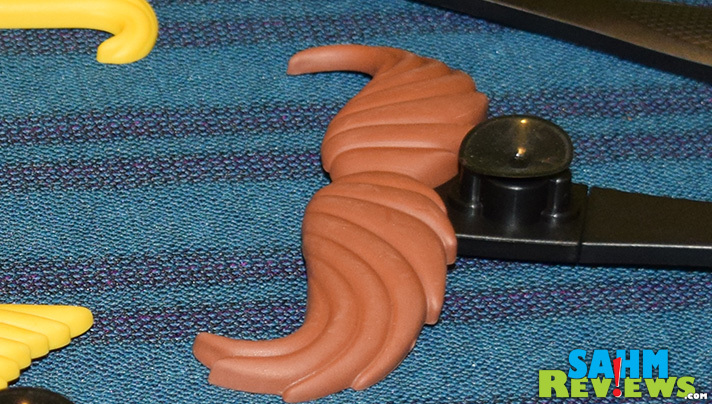 Now you must continue using a moustache of a different shape or color (or both!). 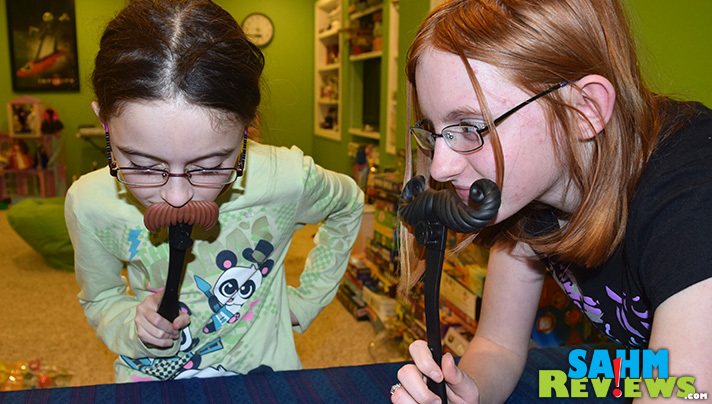 Ratcheting up the silly quotient is the requirement of wearing your ‘stache before a card can be played. Every person must hold their moustache up to their face to signal they are ‘ready’. 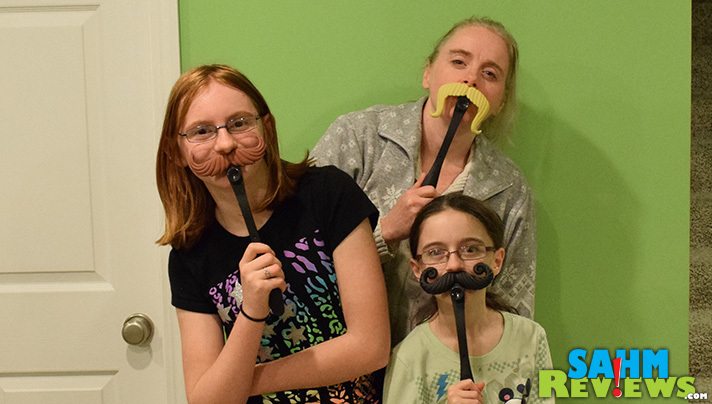 Nothing like seeing a full handlebar moustache on your 12-year-old daughter! 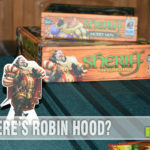 Designed for 3-6 players and ages 7 and up, it really is appropriate for nearly any age. In fact, like most games in this category, the younger kids (with faster reflexes) usually end up winning it all. 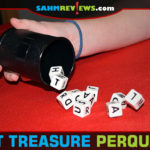 Super-easy to learn and a good choice for a sleepover or birthday party game. Available on Amazon for under $13, it is also perfectly priced as a gift to bring TO a birthday party for a classmate. Of course you know Spin Master from years and years of great toys and games, so be sure to check out their brand websites to see what they have in the works! What game looked silly to you and then you discovered you enjoyed it once you played? We love Mustache Smash!! 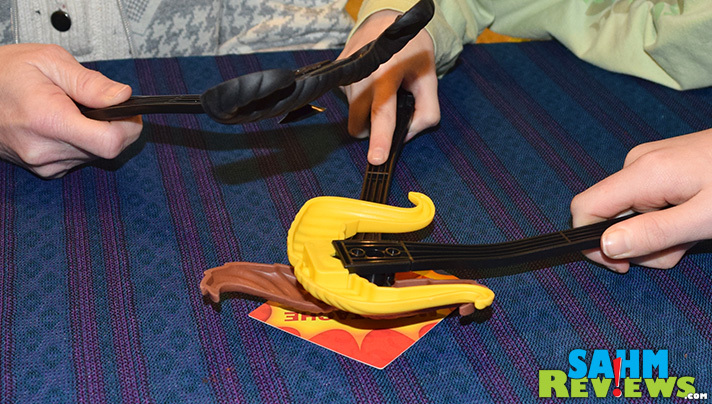 We tried it at the Chicago Toy and Game Fair and fell in love. The kids got it for Christmas! This looks like a cute game. I bet my kids would enjoy this game. Very cute! I have a feeling this one would be a huge hit with my kids, and husband too. Game nights have become one of our favorite ways to spend the evening as a family, especially while the days are shorter and cold. Will have to keep an eye out for this game! This looks like so much fun. Perfect game for kids. 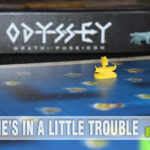 What a funny and cute game to play with the kids, love this idea lot! 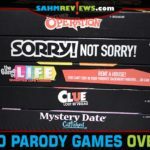 The game I thought was too silly for me would be Hedbanz. It is so fun and easy to play and everyone looks hilarious with their headbands. By the way, I love your reviews on games. My family and I are always looking for old and new games to play. Thanks! Glad to hear it Christina! We have Hedbanz also, and you’re right, until you play it you think it is silly. They have a new one just released, Hedbanz Act Up, which we’ll be highlighting here within the next month or so! Interesting looking game! Sounds like the whole family could enjoy this! that looks so much fun. I bet my daughter would love that game. will have to look into getting for her. This looks so much of fun & I can see the kids are enjoying it to the core. My kids are going to love this game for sure. Thanks for sharing. I’ve never heard of this game but it looks like it could be a lot of fun. I like games that make me laugh. What a fun little game! I love the cute little mustaches! So adorable! This would be a great gift for my cousin’s kids, thanks for sharing!